Twitter Capsule: Two-ply structure finessed for endless, vital nuances in invigoratingly acted, edited, and lensed marital autopsy. A delightful comedy as well as a probing and tender character study, Love and Death on Long Island has all the only-in-Britain drollery of Four Weddings and a Funeral or The Full Monty, but none of the clunky mawkishness that kept those films from really taking off. John Hurt stars as Giles De'Ath, a fusty English man of letters who stumbles into the wrong movie theater one afternoon while he is locked out of his flat; he is about to walk out on Hotpants College 2clearly hoping that no one noticed him walking inwhen he is suddenly, indescribably seized by the vision of a white-bread young teen idol appearing on the screen. 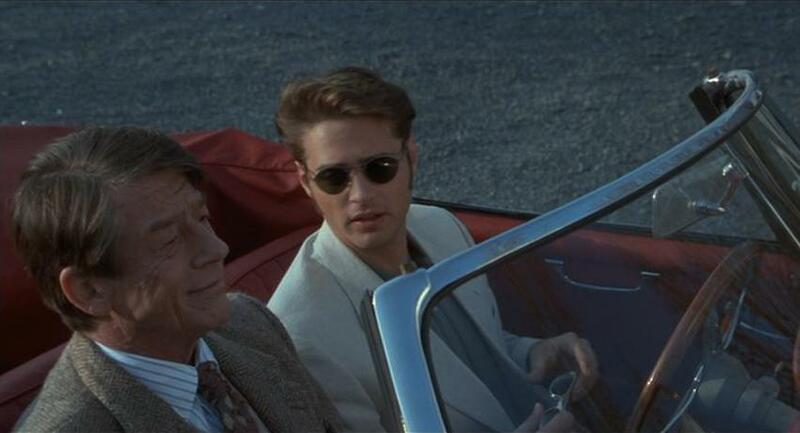 What we see is Jason Priestley, playing a character named Ronnie Bostock but who may as well be Priestley himself, known for his earnest efforts to really Act in whatever pea-brained script Aaron Spelling has handed down the pike. Ronnie clearly thinks he has potential as an actor, and that he only needs good material to show the world what he is capable of. But Giles doesn't know any of that yet, and more than an hour of Love and Death on Long Island passes before Priestley appears as anything more than a flickering image. None of that matters, at least not yet. Giles' reaction to Ronnieand a primary, constant strength of Love and Death is its refusal not only to name his reaction, but to make it seem "nameable" at allis instant and totalizing. A man who has never owned a television, much less a VCR, suddenly has both technologies delivered to his study so he can watch Skid Marks, Tex Mex, and the other opuses of Ronnie's canon. All of this is as amusing as it sounds, but Hurt's magnificent and sensitive performance also makes the whole scenario unexpectedly poignant and sweetly sad. The picture, like its title, almost always conjoins its brightest emotions with its more melancholy ones, the result of which is that the whole film plays more plausibly and engagingly than it might, and our identification with Giles is immediate. Who, after all, specifics notwithstanding, has not experienced an attraction that seemed impossible, an undeniable gravitation toward something fresh and exciting that didn't also make us feel awkward and removed? Giles goes to all kinds of lengths trying to make sense of his feelings. He clips all the information he can out of Teen Beat-style celeb mags, memorizing Ronnie's opinions on "What's Hot and What's Not," and archiving all of it in his notebook on Bostockiana. The incongruity of his oak-paneled, drawing-room style library and the shiny pinks and yellows of the magazines is an easy laugh-getter; but the earnestness with which this academic really is studying this emergent subject doesn't seem out of his scholarly character at all. In fact, one of the ways Giles tries to understand his infatuation is Ronnie's sheer unexpectedness as a topic to entertain. He also makes connections between Ronnie's appearance in Hotpants College 2 and a Pre-Raphaelite painting called The Death of Chattertonmight Ronnie represent an exciting liaison between highbrow and high-school culture? Might he instead be the object of feelings slightly more taboo? Giles eventually decides he needs to meet Ronnie in order to deduce the exact reason for his appeal; then again, his flight to the U.S. could just be an impish, impulsive wish to be in the presence of his idol. Kwietniowski doesn't boil it down. The portion of the film in which Giles finally meets Ronniefirst through Ronnie's girlfriend Audrey (Fiona Loewi)is less obviously comic than the beginning of the film but as rewardingly thoughtful, and thought-provoking. Audrey seems to see through Giles, who justifies his interest in Ronnie as on behalf of a "niece back home," but she is interested enough in where his act is going that she chooses not to expose him. Eventually, Giles must stop being so cagey, but there is nothing inevitable or even predictable about what he confesses or how this information is received. I suspect that if Love and Death on Long Island had been made in Hollywood, the Giles character would have been played more buffoonishly, and his behavior more outlandishly modified in the presence of startled colleagues. He would have sought Ronnie not in a quiet beach town, but in the heart of a city, where the potential for broadly humorous culture-shock gags would skyrocket. Audrey would have been vampier, or else an easy gag, like Matt Dillon's girlfriend in In & Out; Ronnie a lot dumber; and Giles suddenly "liberated" from crusty academics into some sort of "cool for an old guy" wild abandon. I love Love and Death on Long Island for recognizing that when our lives change, they do not always change for reasons we understand, nor does everything about us tend to change at once. Not only does everyone in Kwietniowski's film get to be reasoning and intelligent, if often a bit in a fog, they all seem to have a sure sense of who they are and where they want to eventually find themselves. They are a wonderful gallery of characters to spend time with, even when we realize that the bright ending we might be hoping for probably cannot occur.